A former head of Israel’s Shin Bet,Israel’s security agency, recently said that Israel doesn’t want to stop the price tag attacks that have terrorised the residents of Yatma and Palestinian communities throughout the West Bank. Carmi Gillon’s comments at a cultural event were reported in Jerusalem Post. He said that Shin Bet could stop the attacks if it wanted (presumably as criticism of the present administration). His comments were echoed by former head of Mossad, Shabtai Shavit. ‘Price Tag’ attacks are carried out by extremist Israeli settlers typically when the Israeli government does something they don’t like. For the most part the victims are Palestinians, although occasionally the extremists target Israeli government property. Attacks are often arson attacks against cars, spray painted walls, slashed tires, burned olive trees, uprooted crops. Yatma and the area south of Nablus have been plagued by these attacks, and the Israeli occupation forces have rarely done anything to identify the attackers. (In a rare exception, Israeli police recently arrested several people from the settlement of Yitzhar, which is just a few kilometres from Yatma). On the 7th November settlers from Rechelim uprooted over 100 olive trees and sprayed racist graffiti in al-Asawiya near Yatma. The graffiti on the village mosque said “Death to Arabs” and “Price Tag” in Hebrew. 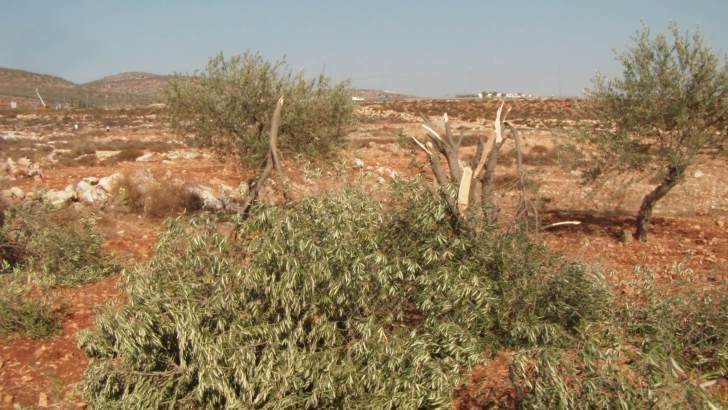 The olive trees were planted on land belonging to Hamad Salih Mahmoud Hijazi, Salih Naser Gazi and Mustafa Ali. It was only the previous week we, International Women’s Peace Service, had been picking olives with two families from al-Asawiya. Pleasant times (if a bit arduous in the beating sun! ), sharing our limited language, drinking chay made on open fires and eating delicious picnics on the ground under the olive trees. The olive crop is the main source of income for famers in the West Bank. Nearly half (48%) of the agricultural land in the occupied Palestinian territories (oPt) is planted with 8 million olive trees; the vast majority are in the West Bank.The olive oil industry makes up 14% of the agricultural income for the oPt and supports the livelihoods of approximately 80,000 families. 870 trees were uprooted or destroyed in the first week of the olive harvest, which starts around 5th October – see www.guardian.co.uk/2012/oct15/israel-olive-trees-settler-attacks. I will send complete details of the destruction when OCHA have finished collating the data. 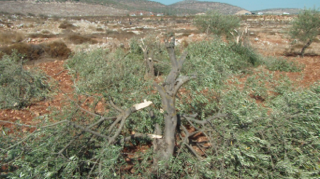 Settlers, probably from the Rechalim settlement, have destroyed olive trees belonging to farmers from Yatma, in the West Bank, near Nablus. The attacks on trees are part of an escalation of attacks on Palestinian property throughout the West Bank this year. Some of the attacks have been part of the ‘Price Tag’ programme, some are unattributed.